Eli Shaw swings at a pitch for the Washington Blue Lions in a Frontier Athletic Conference game against Chillicothe Friday, April 5, 2019 at Washington High School. 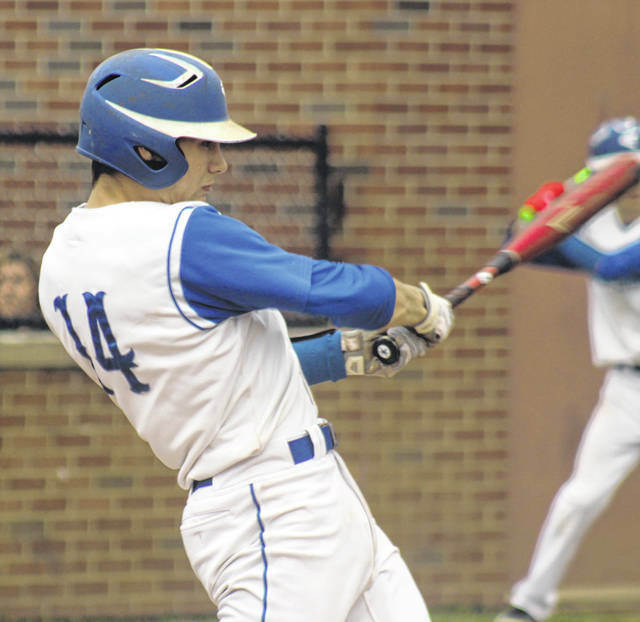 The Washington Blue Lion varsity baseball team hosted the team from Ohio’s first capital, the Chillicothe Cavaliers, for a Frontier Athletic Conference game Friday afternoon. The Cavs won the game, 8-3. Reece started and got the win for Chillicothe. He pitched five innings with seven hits and two runs (one earned) with three strikeouts and two walks. He hit two batters. Byers pitched two innings with three hits, one run (unearned) and two strikeouts. Ryan Schwartz started and suffered the loss for the Blue Lions. He pitched three innings with five hits and six runs (three earned). He struck out five and issued one walk. Brock Morris pitched three innings with five hits, two runs (both earned), one walk and one strikeout. R.G. Crabtree pitched one inning with one hit and two strikeouts. Chillicothe scored one run in the first, three in the third and four in the fourth for an 8-0 lead. Washington got on the board in the fourth and scored single runs in the fifth and seventh innings. Bailey Roberts was the leading hitter for Washington, going 3 for 4 with one run scored. Jared Hall was 2 for 4 and Cortez O’Flaherty was 2 for 4. In the fourth for the Blue Lions, Brock Morris led off and was hit by a pitch. Roberts singled and the next batter popped out. O’Flaherty reached on an error that loaded the bases. Tyler Tackage was hit by a pitch, forcing home Morris. The next two batters were retired. In the home fifth, George Reno singled and Tyler Rood followed with a single. Morris had a bunt single, loading the bases. After the first out was recorded, Eli Shaw grounded out, scoring Reno. Rood was out trying to reach third. In the bottom of the seventh, with one out, Roberts lined a single to left field. Shaw reached on an error. O’Flaherty singled to load the bases. Tackage grounded out, scoring Roberts. O’Flaherty was out advancing to second and the final out was a grounder to shortstop. Washington (1-5) is at Jackson Monday and at Greenfield Wednesday to take on McClain. Game time is 5 p.m.
Offensively for Washington: Jared Hall, 2-4; George Reno, 1-2, 1 run, 1 bb, sac, sb; Tyler Rood, 1-4; Ryan Schwartz, 0-1; Brock Morris, 1-1, 1 run, hbp; Zane Joseph, 0-1; Bailey Roberts, 3-4, 1 run; Eli Shaw, 0-4, 1 rbi, roe, fc; Cortez O’Flaherty, 2-4, roe; Tyler Tackage, 0-3, 2 rbi, hbp, fc; Karson Runk, 0-4, fc. LOB: 11. Offensively for Chillicothe: Harris, 2-4, 1 run, 2 sb; Reece, 1-3, 2 runs, 1 bb, roe; Conley, 1-2, 2 runs, 1 bb, sac, sb; Coats, 3-4, 1 run, 4 rbi, 1 2b, sb; McNish, 0-4; Seymour, 1-4; Valentine, 0-4; Cain, 3-4, 1 run, roe, 3 sb; Doss, 0-4, 1 run, roe. LOB: 7.